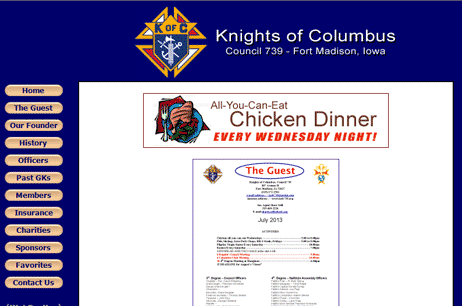 Many years ago, the local Knights of Columbus council approached me and asked if I could upload a monthly newsletter to their website. After two months of wrestling with their website, I told them that I would happily build them a completely new site if they would let me. The reason was that the old site was horrendous to work with and even the seemingly simple task of posting a new newsletter once a month took WAY too long. So I build a very simple, yet simple-to-maintain, website for them. They wanted a very basic site with strong colors and an easy-to-use navigation system. Voila!